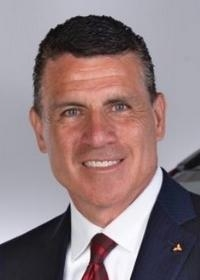 Fred Diaz took over as CEO of Mitsubishi Motors North America in April and immediately began traveling the country to meet with his dealer body. During a May interview, Diaz pointed to one early meeting with the dealer advisory board that stood out. "We bounced ideas off of them. They bounced ideas off of us. I think it was very refreshing for them to see the level of interest we have in hearing their input," Diaz, 52, told Automotive News. "What are we doing wrong? What can we do better? They haven't had that type of exposure to the person in this chair and that type of direct interaction." Diaz is taking an open approach with his role as the automaker looks to expand its U.S. dealer base, particularly in California, Florida and Texas. The automaker is forging ahead in its alliance with Renault and Nissan, which will lead to new platforms and technologies to bolster Mitsubishi's lineup. Diaz says each side has gadgetry that could potentially be worked into the others' portfolios. Diaz wants Mitsubishi to be closer to its dealers, so the brand is boosting its regional presence. Mitsubishi announced in July that it was increasing its U.S. field operations to four zone offices from two, by adding regional offices in Cypress, Calif., and Orlando.